Years ago while I was searching online for muruku cookies (well if it ever exists), I stumped upon this interesting recipe on Epicurious.com. I saved it to my “baking adventure” list, but never really get to it until recently– when I was looking for new cookies ideas for my upcoming Chinese New Year bake. This cookies is pretty easy and simple to make. The coriander flavor is mild but I can’t really taste curry flavor. Maybe next time I’ll increase the amount of both… I added curry leaves (I just love the aroma of curry leaves!) for more flavor. The texture is very similar to Chinese Walnut Cookies 核桃酥– very shorty. The savory flavor and bits of curry leaves does take away some richness of the typical shortbread cookies. Just like my other shortbread cookies, I made these cookies bite size due to its richness– perfect to go with a cup of tea! Don’t be fooled by its meh look– the flavor is a bomb and will get you hooked! In a clean dry pan, toast ground coriander at medium heat with a spoon for a couple of minutes, until the aroma comes out. Remove from heat, and repeat the process with curry powder. Combine Coriander, curry powder and flour. Set aside. In a large mixing bowl, whisk butter and sugar until fluffy. Add in salt, vanilla extract and curry leaves. Stir to blend well. Add flour mixture to butter mixture. Use a silicon spatula to blend well (mix and press down motion), until no visible dry crumbs and forms a soft dough. Take a small portion of the dough and roll to a ball of 1 inch diameter. Repeat with remaining dough. Place balls on a lined baking pan, 2 inches apart (Cookies will spread after baking). Press down the balls to form a disc of 1 1/2 inch diameter. Brush with egg wash.
Bake at 350 F oven for 15-20 minutes, until golden brown. Cool on the pan for 5 minutes then transfer to cool on a rack. Store in air tight container. Coriander: if whole Coriander seeds is used, grind the seeds in coffee grinder or spice grinder before toasting in pan. Flavor: the flavor of curry powder and coriander is mild. Increase the amount of both for stronger flavor. Next time try adding 1 tsp of toasted cumin seeds for layers of flavors. Egg wash: to use up the egg wash, I brushed the cookies twice– first time before baking, and second time after 15 minutes in the oven. I got some precooked Jonah crab claws at Safeway when it was on sale. Instead of dipping the crab meat in clarified butter or cooking it Malaysian buttery curry style, I decide to try something new~~ Singapore black pepper style! I did a very last minute recipe search online and used this recipefor reference. OMG it was so good! For the mount of the crab claws I used, I think I put a bit too much peppercorns(on top of 4 red hot peppers in it)… It was VERY peppery and spicy, and yet I just couldn’t help licking the sauce on the shells, on my fingers (yes, it requires all ten fingers!). Now I have another delicious crab recipe on file :-). Next time I will try the recipe with fresh Dungeness crabs instead of pre cooked crab claws; I’m sure the flavor will get even better. Make a few cracks on each claws if they are not cracked previously. Pat dry with a paper towel. If you prepare ahead of time, place cracked claws in bowl/container lined with paper towel. Cover and chill in the fridge. Bring to room temperature when you are ready to cook. Heat up a wok on high heat. Add oil, butter, ginger, garlic, red hot pepper and curry leaves. Fry until butter melts and the flavor comes out. Add crab claws and stir fry for a minute. Add in ground spices, stir to distribute evenly. Cook for another minute or until crab claws are heated through. Add in sauce mix, stir a few more times. Add a few more tbsp of hot water if you prefer more sauce. Dish out. Serve immediately. Crab claws: I used precooked crab claws this time because that was what I had at that time. However, I don’t suggest using frozen precooked crabs/crab claws as they usually taste nothing like crab– salty, tasteless, rubbery etc. I got lucky is time as my frozen precooked Jonah crab claws still tasted like crab. 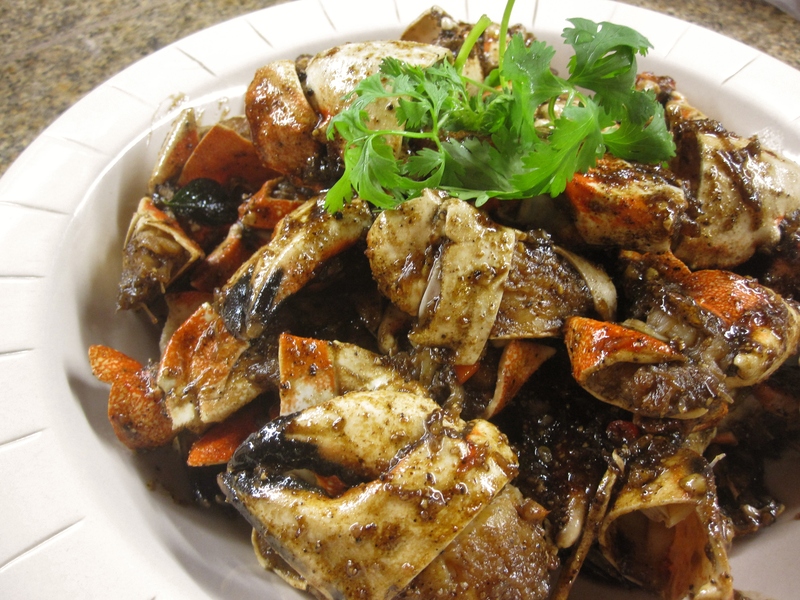 Fresh live crabs are the BEST for this recipe because of its fresh seafood flavor. If fresh crabs are used in this recipe, cut crabs into chunks, then follow the steps and cook crabs until it is just cooked through. Then add in sauce mix, stir for a few times before dishing out.